True2Ourselves Forums > Community Topics > Christianity & Science > Life on Venus? The photographs feature several objects, which Ksanfomaliti said, resembled a "disk", a "black flap" and a "scorpion". All of them "emerge, fluctuate and disappear", the scientist said, referring to their changing location on different photographs and traces on the ground. "What if we forget about the current theories about the non-existence of life on Venus, let's boldly suggest that the objects' morphological features would allow us to say that they are living," the magazine quoted Ksanfomaliti as saying. My question is if the Pope is going to allow his astronomer to go to Venus to baptize them? I'm still pondering that statement that he'd like to baptize space aliens. Would beings on another planet need to be baptized? Уважаемые всем мире товарищи будущие СССР! Пожалуйста, не верю, что у меня выставлены классические симптомы слишком много водки: "черный лоскут", "диск", и ужасные "Скорпион"! Нет, нет, нет! Это товарищ Виталий Виталис N, который заставил меня страдать за пределами слов, Mamushka! с ужасной музыки, которую он посадил борту судна для моей поездки в сторону солнца. Изо дня в день в течение четырех месяцев он играл, как лай волка из ада! О, как я хотел снимать мой мозг с помощью гвоздя ружье! Что мне было делать, кроме извлечения 33,3 LP обложки альбома и диск Skorpion из Смоленска основе подземных Skorpions рок-группы, как только я приземлился на этой несчастной планете. Извините, мне надо идти. Я загорелся. . . . . . несчастный, горячий. . . . Да здравствует товарищ Генеральный секретарь Брежнев и его великую победу над mujahi. . . . . . .
Beep Beep. . . . . . . . . .
Dear world-wide comrades of the USSR future! Please do not believe that I have exhibited the classic symptoms of too much vodka: the "black flap", the "disk", and the terrible "scorpion"! No, no, no! It is Comrade Vitaly N Vitalis who made me suffer beyond words, Mamushka! with the horrible music he planted ship-board for my trip towards the sun. Day after day for four months it played like a wolf baying from hell! Oh, how I wanted to shoot my brain with a nail-gun! What was I to do but eject the 33.3 lp album cover and disk Skorpion from Smolensk-based underground rock group Skorpions as soon as I landed on this miserable planet. Sorry, I have to go. I have caught on fire . . . . . . miserable, hot hot . . . . Long live Comrade General-Secretary Brezhnev and his great victory over the mujahi . . . . . . .
beep beep . . . . . . . . . .
My question is if the Pope is going to allow his astronomer to go to Venus to baptize them? Only if they pass the strapped to the heated Vatican boilers with nothing on but loincloth and sandals test for at least seven days. I'm still pondering that statement that he'd like to baptize space aliens. Would beings on another planet need to be baptized? He said they'd have to ask, so he might think they probably know something we don't. Menti indagatore vogliono sapere se il peccato originale si applica agli stranieri spazio? Avevano antenati come Adamo ed Eva che è sceso dal innocenza? In lingua inglese: Inquiring minds want to know if original sin applies to space aliens? Did they have ancestors like Adam and Eve who fell from innocence? This doesn't look like a scorpion to me. It looks more like an Egyptian mummy to me. Or the Shroud di Venere via Torino. We'd have to ask them I'd guess. Maybe a half bottle of vodka will help clear this up for me. It's written that all have sinned. We could at least be broadcasting religious programming, just in case. 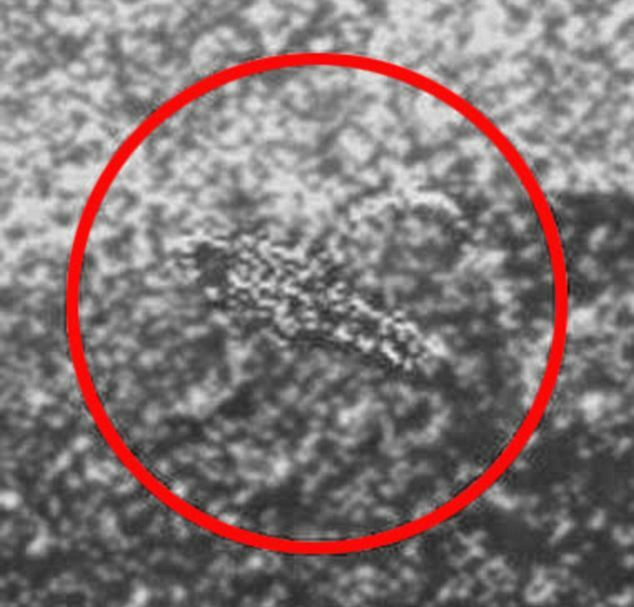 According to Jonathon Hill, a research technician and mission planner at the Mars Space Flight Facility at Arizona State University, who processes many of the images taken during NASA's Mars missions, higher-resolution versions of the Venera 13 images show that the crablike object is actually a mechanical component, not a living creature. The same object shows up in a photograph taken by an identical landing probe, Venera 14, which landed nearby on Venus. "If those objects were already on the surface of Venus, what are the chances that Venera 13 and 14, which landed nearly 1,000 kilometers apart, would both land inches away from the only ones in sight and they would be in the same positions relative to the spacecraft? It makes much more sense that it's a piece of the lander designed to break off during the deployment of one of the scientific instruments," Hill told Life's Little Mysteries. The other photograph highlighted by Ksanfomaliti, which supposedly shows a scorpionlike creature, contains a blur. "The features that Ksanfomaliti shows are nothing more than processed noise, at best, in some particularly bad versions of the images. They are not in the original data," Stryk said. Oh, lucky for us we didn't send missionaries too quick. They could have been fried to a crisp and all for nothing. Put your money on Enceladus, a moon of Saturn. Despite being 1200 billion km from Earth and only 500km in diameter, Cassini did a fly-by at a height of only 50km. I can't get my head around those figures. Too small for life, I would think, unless tiny robots evolved that can survive without an atmosphere.